Are you a Business Owner wanting more Time and Clarity to Grow your Business? My Time for Business Growth Membership site is for Business Owners looking to gain more from their businesses and in their own lives. To get a greater understanding of how their business can help provide the life outside of it that they desire. I’m Amanda Holges. I have over 30 years’ experience in running my own businesses, having taken my family audio-visual business to a 7 figure sum. I now use the experience and knowledge I have continued to gain to help others develop themselves and their businesses to achieve the level of success they desire. The Membership Site is full of courses designed to help businesspeople like yourselves to develop your skills and identify areas of your business and personal mindset that you can work on. From productivity tips to cash-flow, and paying the bills to achieving your ultimate dream, we explore methods and hands-on advice to help you get a better understanding of your business, your time and your desires. Courses include ‘Understanding Your Mindset’ and ‘Goals’, which are available in various formats, such as video & audio, as well as other resources including task sheets, templates and workbooks. A whole host of content to grow your business success, and enjoy life outside of it more too! 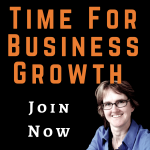 Click below if you want to know more about how to join my Time for Business Growth membership today.